Festive Attyre: the Curtain-Along is a go! Has anyone figured out the difference between the $18 fabric and the $23 fabric at JoAnn's? They have some colorways (like blue) at both prices and I can't see a difference . . .
Aurora - I can't figure that one out either! I know some of these are heavier outdoor fabrics, but neither of those blue colorway listings mention that. ??? Ok, I'm in! But I bought a different print. But it's still a curtain panel. Does that count? I really want to see someone make a banyan and a matching cap out of the embroidered pillow! BTW, the SNS (or SUN N SHADE) fabric is the "sunbrella" one, probably stiffer than the non-SNS one and is !00% poly. 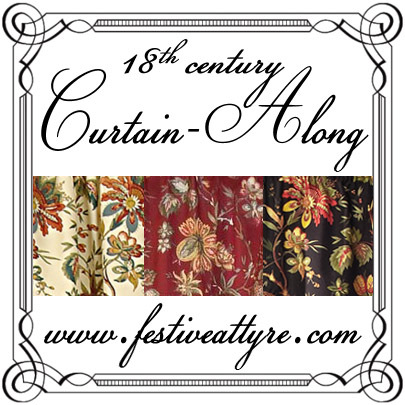 Now you make me want to buy some curtains to make a new 18th century frock. Those prints are fantastic ! Must. Resist. CADD. Ok, I went to JoAnn's today, and they had the 17.49 blue colorway and it seemed perfect for this project: slightly satin-y cotton with a slightly cream background and a bold blue print. I dunno what the more expensive one is, but for people wanting to buy online the cheaper one is good for dresses imo. I bought the creme lowes curtains a little while ago. 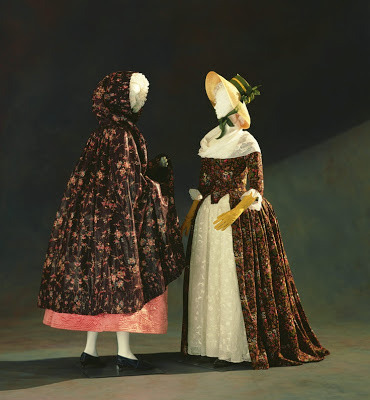 I'm probably going to make some sort of round gown/anglaise out of it with a white petticoat. I'm 35 weeks pregnant right now though so I probably wont actually make this until next year. ah well! Thanks for posting the yardage estimates and ideas of what you could make out of how many curtains, that's pretty great! I got three panels because I'm tall and didn't want to worry about not having enough. This is such a fun idea! I love it. I bought the blue a while ago form Joann's. It is light enough weight for dress, but it isn't satiny like the curtains. It is a little stiff, but not heavy like an outdoor fabric. Though I think a lot of the Waverly prints are outdoor weight so you must double check. Alright, I just might have been bitten by this bug. First I need to finish the 40s kit, then... remake my stays. Then we'll see if this happens. :) I'm loving the crimson, but not so much the price! The Amazon Prime deal for the creme et noire is much more tempting, but the colors... Hmm. Kudos to you, Jen! I am having a new print 18thc. gown made for NEXT summer. I already had several budget friendly, possible choices of 18thc. style print fabric samples on my computer in my 'new gown' folder, trying to decide what I wanted, and one of them was that creme print curtain from Lowes! While I like it, it is not "THE ONE" that wows me for what I want this time, but it's nice to see what you are doing. I have used curtains in the past to make several things! The fabric is on sale!!! I just got an email from Joann - all their fabric is on sale 60% off on the web site only until Saturday (Sept 15th). It's all selling for $13.99 & $17.99 - even the blue colorway. Get it while you can! I bought some of the curtains, I couldn't resist! I need to make stays first though...but I think this will push me to get them done! My fancy was piqued when you mentioned doll clothing. Unfortunately, the scale is far too huge to really work for that purpose. On the other hand, if there are any scraps for sale after this challenge, I'd be happy to help take some off of people's hands. I'm sure thay would make lovely kerchiefs or aprons. Well I'm in. I've a Lowe's very close to me and I fell in love with the fabric when I saw it. Plus I need another 18th Century gown. I'm thinking the creme over a red petticoat. SHould be fun to see how it all works out! I'm in too. There is a cream print sacque in my future. Unfortunately, Lowe's kicked up the price on the cream colorway to match the others so I ordered from Amazon. Here's hoping they come soon; I started patterning the lining last night! I've just ordered the black colorway from http://www.housefabric.com/Felicite-Noir-P5414.aspx It's $15.95 a yard. I'm planning a sacque gown, to be done by the end of March. I just found some curtains of my very own, but I am new to this era of gowns, can anyone point me in the right direction for patterns? I have two panels. its looks like retro kind of design and trend now.these designs will give ancient look and i also designed some fabrics like this.